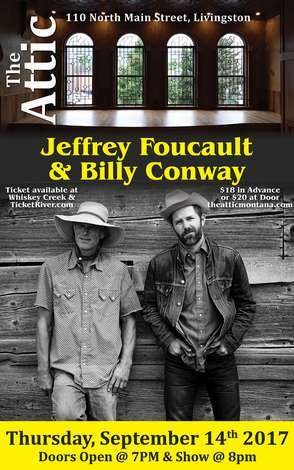 One of the finest songwriters of his generation, Jeffrey Foucault has taken, in his own words, ‘the small roads;’ building a brick and mortar independent international touring career of ten studio albums, countless miles and critical accolades. He’s been lauded for Stark, literate songs that are as wide open as the landscape of his native Midwest (The New Yorker) and described as Quietly brilliant (The Irish Times), while catching the ear of everyone from Greil Marcus to Don Henley (who regularly covers Foucault in his live set), to Van Dyke Parks (who offered to play on Foucault’s 2011 offering, Horse Latitudes, after catching a live radio interview). ‘Salt as wolves’ is a line from Othello describing boldness; a fitting title to frame a record of blues played bold and loosely, without rehearsal or cant. With his fifth collection of original songs Foucault stakes out and enlarges the ground he’s been working diligently all the new century, quietly building a deep, resonant catalog of songs about about love, memory, God, desire, wilderness and loss. SALT AS WOLVES gives us Jeffrey Foucault at the height of his powers, fronting an all-star band, turning the wheel of American music.